Thanks to the latest version of our own unique suspension dynamics software, developed over 25 years of successful motorsport, we can now prescribe damper rates for your race car. This development enables us to give you (or your damper manufacturer) close guidelines for the force/velocity curves required to optimise your dampers to suit the specific car for which they were designed. Wheel frequency in Hertz and cycles per minute. Damper rate bands for bump and rebound in Newtons per metre per second. Roll moment distribution in percentage from the front. Anti-roll bar rates required, with material specs. Phase 2 is the full 3D suspension kinematics and dynamics analysis (Chassistech, below). This is usually best carried out by us either at your site or ours, but the data can with care be collected by you or your Engineers. Next... is tyre spring rate testing, static ambient tyre spring rates are measured on our rig at a variety of camber angles and pressures, and then used in the dynamics calculations for another degree of accuracy. Also... the next essential tool is our new anti-roll bar test rig. We can now rate your anti-roll bar – just send it over and we will tell you exactly what it is doing. Include all the linkages and the movement ratio wheel: bar, and we will tell you what the anti-roll rate at the wheel is. Or... we can design an anti-roll bar for you, recommend the rate, and supply the parts with rating test certificate. Fill in this simple table with values from your car and we will give you the answers – or the parts and the answers too. 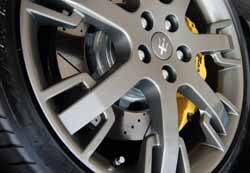 DTMPower offers a suspension dynamics assessment and design service called “Chassistech". 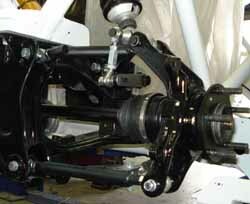 This entails a full measure and survey of the vehicle's suspension system, measurements are taken and a schematic CAD drawing of the suspension is produced. This will show the front and rear roll centres, virtual swing axle lengths, scrub radii, and spring, damper, and anti-roll bar movement ratios. From this data it is possible to predict the handling characteristics of the vehicle, and then more importantly, make the necessary changes to the roll centres, virtual swing axle lengths, spring rates and anti-roll bar rates, to optimise the handling. The final report will detail all the necessary changes in suspension pivot point locations, required spring rates, and the dimensions and specification of material for the fabrication of revised anti-roll bars. This will achieve the optimum handling performance from the car. This report will of course take into account other design parameters such as; driver ability, tyre size and performance, and technical regulations controlling the category in which the car is raced, or whether it is for fast road use. It is possible to undertake this survey at almost any point in the construction or running of the car. The cost of this service is £850 for a budget 2D process, or £1850 for a full in-depth 3D analysis (plus travel expenses). Attendance at a test or race day is charged at £550 per day plus expenses.